Method: Thinly slice onion and stir-fry in cooking oil until golden brown (this is your piaz-daagh). Add ground meat and fry for at least ten minutes until brownish; stir constantly to separate the meat in smallest bits possible. Add turmeric, salt, pepper, dried lime and mix well. Cut the peeled potato in small cubes; rinse and add them to the frying pan. Stir well while frying the mix for another five minutes. Put the pan aside. Prepare the rice in usual way (soaked in salted water, drained, boiled in lots of water, drained, and steamed cooked for at least one hour). At the stage when you want to mount the rice back in to the pot, simply mix it with the contents of your frying pan first. You could also pour them back in the pot in layers (one layer of drained white rice and one layer of meat mix). If the latter method is used, the pot’s contents should be mixed well when you want to serve. 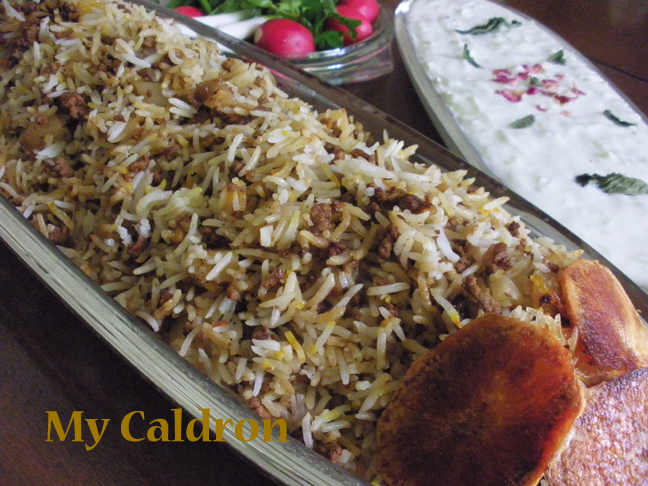 I also sprinkle powdered saffron on the top of the mixed polow before letting it steam cook. The steam releases saffron’s taste and colour. However, a more conventional way of using saffron is to soak it in warm water for 15 minutes and mix it with a small portion of rice and then use that portion as garnish on top of the serving dish.